Folks, I’ve tried to make eggplant parmesan a few times in my life, but last night I finally succeeded making THE best version; it’s finally something I feel comfortable serving to other people. 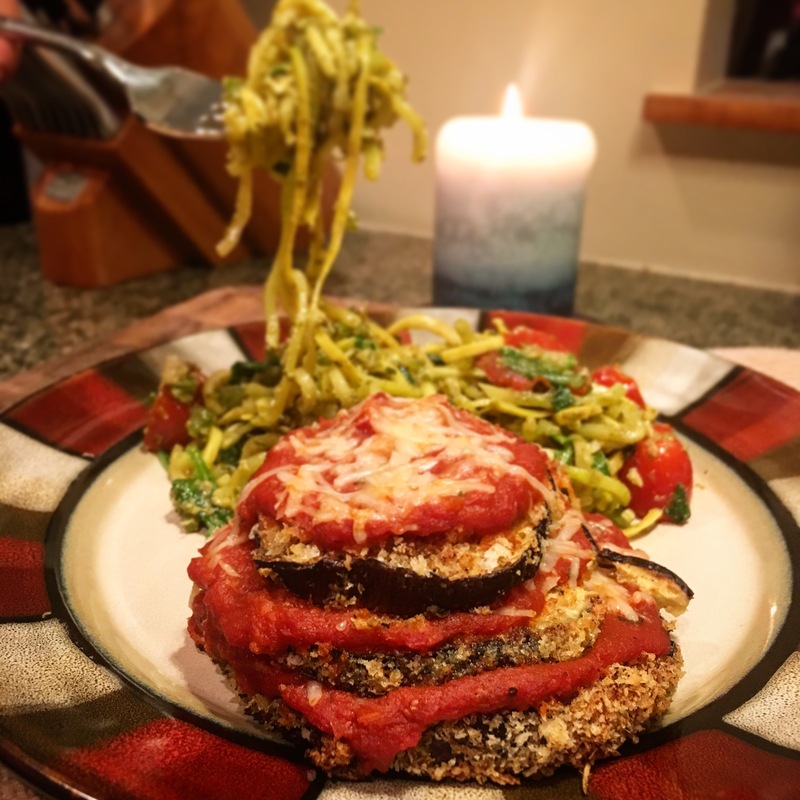 I don’t know what it was, but when I went grocery shopping last night, the eggplant was calling to me, and since I’m trying to ramp up meal prep, I figured baked eggplant parmesan stacks would be convenient and economical for packing lunch for the rest of the week. As usual, I referred to my culinary consultant, Google, to search for an easy eggplant parm recipe, and I picked a Whole Foods one to follow. (Though, as you know, recipes are mere suggestions to me, as I typically give it a glance for the basic points, and then work my own magic from there). The very first time I tried to make eggplant parmesan was during my undergrad years, when I was first foraying into gastronomy. I had my sister and brother-in-law over at my college apartment, and my brother-in-law, who is a skilled cook, had a bite of my eggplant and politely said he had just eaten, so he wasn’t very hungry. I knew then that was a recipe I had to ditch and that I needed to improve my parm game. 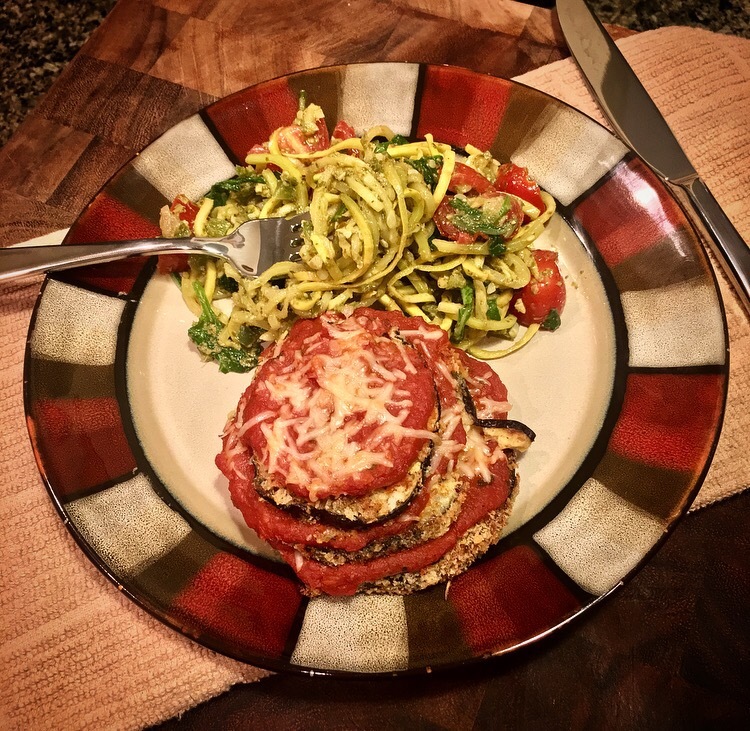 Then, a few months ago, I came across Tasty’s Hasselback Eggplant Parmesan recipe, and it was good, but still didn’t quite hit the spot. Somehow, the eggplant still seemed a bit tough after it was cooked, and I had used a vegan Daiya cheese which just added a weird aftertaste. The eggplant wasn’t breaded enough. Last night I finally got it right, and the trick is patience. I’ve noticed the key to getting tender, flavorful eggplant slices, is of course, to cut them thin, but also to generously let them sweat in a coat of salt for at least 30-40 minutes first. I actually learned this trick that first time I made eggplant parm in my college apartment, but the issue at that time was that the surrounding batter was not enough. It’s certainly all about the texture with eggplant parm. That’s why it’s one of my favorite dishes to order at a restaurant, because it’s harder to make at home. However, if you can put the time into it, making eggplant parm at home has a few benefits. In my version, I’ll admit it’s a less-than-ideal dish for your health, but making it at home is still healthier than what you order at the restaurant because you can control the ingredients. For one, I used minimal cheese– just enough to keep the stacks together. I also baked the pieces instead of frying them. And of course there’s added benefit of getting more bang for your buck. At restaurants, eggplant parm ranges $13-20 at a basic Italian restaurant for one portion. At home, with just a few ingredients that you already have in your pantry, and a single eggplant, you can get at least five decent portions. Pair this with a side of zoodles and you’re good to go. 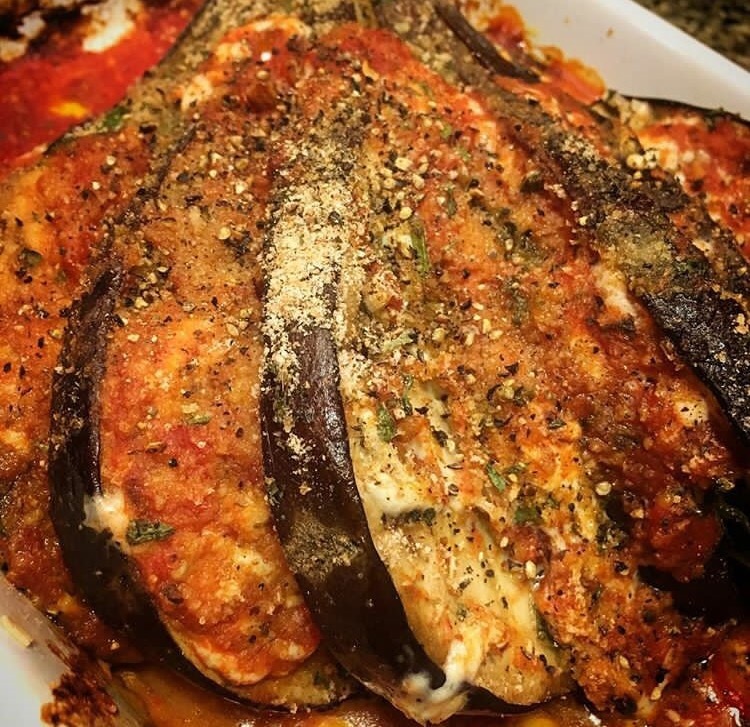 So here’s my homemade eggplant parmesan recipe, inspired by Whole Foods’ recipe. 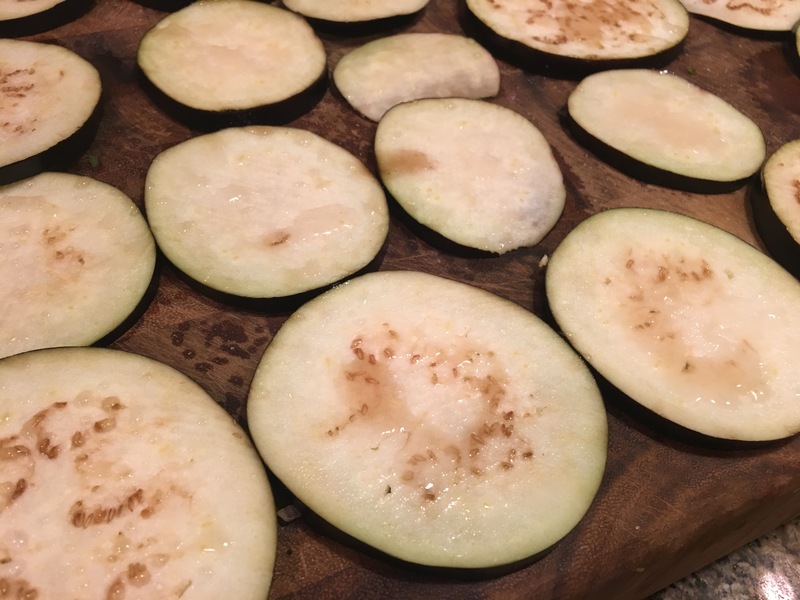 While oven is preheating, slice eggplant into thin rounds. 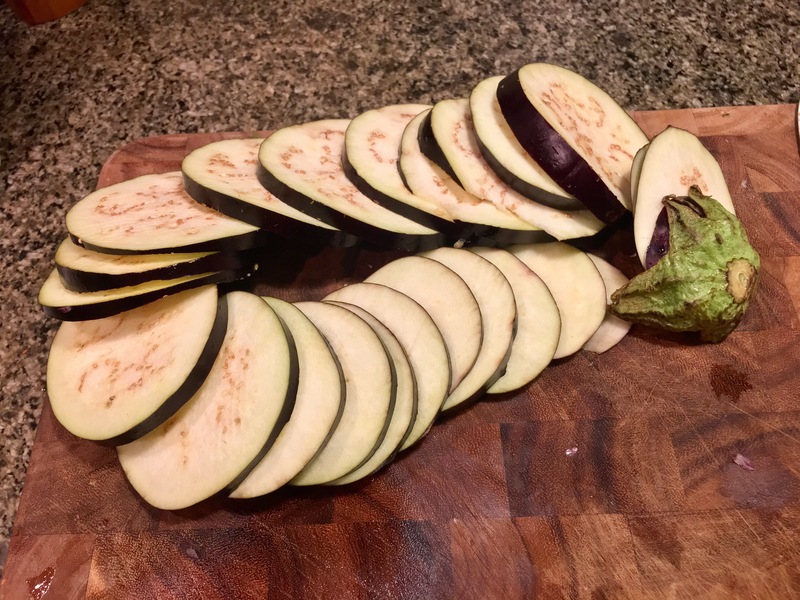 (Some recipes suggest cutting the eggplant lengthwise, but I prefer the compact circles.) Lay the slices apart on a baking sheet or cutting board and sprinkle some salt evenly on the slices. Allow the eggplant to “sweat” in the salt for 20-30 minutes. Flip, and repeat on the other side of the slices. Pour beaten eggs into one bowl and bread crumbs into another other. For the bread crumb mix, feel free to add some crushed red or cayenne pepper for added heat if you wish. Set aside. Grease a baking sheet with about 1 tablespoon of olive oil or cooking spray. 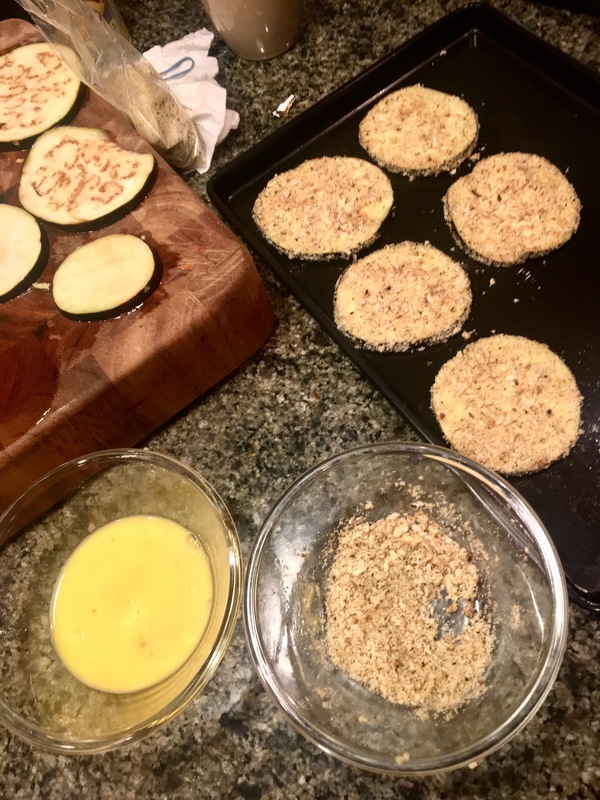 Once the eggplant slices have “sweat” on both sides, start to dip the slices one at a time, first into the egg mixture, letting the excess drip off, and then into the breadcrumb mixture. You may have to coat the slices in the bread crumb mixture a bit more using your hands to ensure there is an even coating. Place each coated slice onto the greased baking sheet. Top each slice with just a dash of shredded parmesan cheese. Drizzle lightly with remaining olive oil and pop the baking sheet into the oven for about 8 minutes. Remove the baking sheet, and flip the slices over. Add a few more drops of the beaten egg to each slice, spreading evenly across each. Sprinkle a bit more of the bread crumbs and just a dash of shredded parmesan to each slice. Pop back into the oven for another 8 minutes. Remove the slices from the oven. 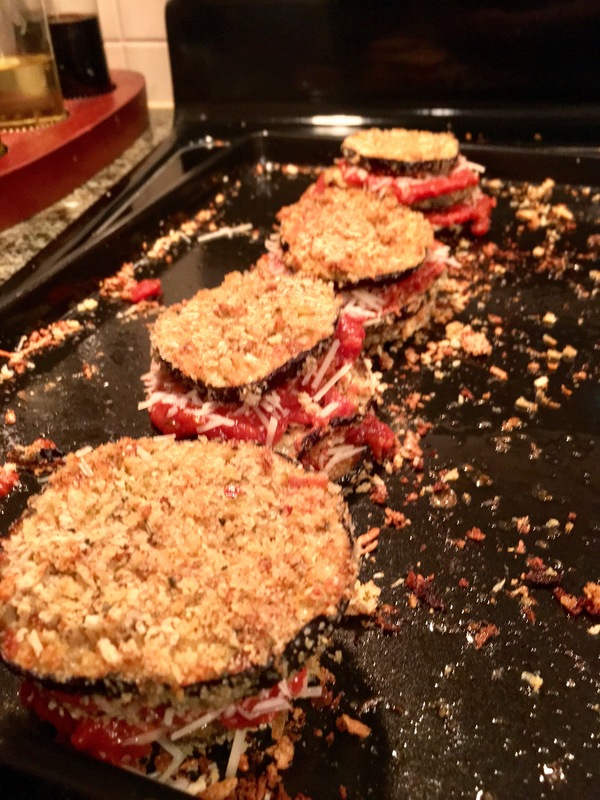 Start to create “stacks” on the baking sheet by layering them: top slices of breaded eggplant with some marinara sauce and just a bit of shredded mozzarella cheese. You only need a enough to keep the stacks together, and a bit on the top for presentation. Pop the baking sheet of eggplant stacks back in the oven for another 10 minutes or until the cheese on the top layer turns slightly golden brown. Remove from oven, allow to cool a few minutes and serve with a side of pasta or zoodles.